When considering all the aspects of a snow plow and how it functions, you can come across some unusual terms. If you’re new to the snow & ice removal industry these terms could result in questions like: “What’s the difference between a solenoid and a manifold? “, “Snowplows can float?” and “what does a pigtail have to do with a snow plow anyway?” To clear up some confusion and for your future reference, keep this snow plow parts glossary of terms handy. While some of the termimology is specific to BOSS Snowplows many of the terms are common across all snow plow brands. Male and female multi-pin rubber plug that connects at the bumper and allows for communication between the truck and the plow. 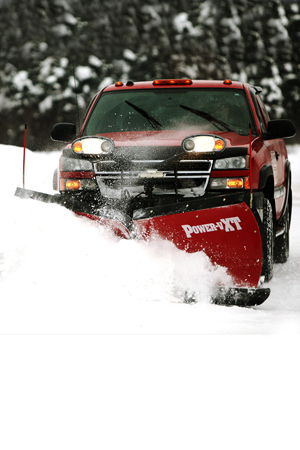 Found on both v-plows and straight blades, the angle cylinders control the left and right movements of the snow plow. Referred to as the “push frame,” the A-Frame connects the center section, on V-blades, or push frame attachment bar, on straight blades, to the coupler. This hydraulic attachment system is activated by flipping a toggle switch into the “up” position at the side of the plow. Then the operator goes into the cab of the truck, and using the raise function on the plow controller, connects the plow to the truck. Then the toggle switch needs to be returned to the “down” position for normal plow functions. The attachment system has a set of pins that automatically engage locking the plow to the vehicle. This hydraulic attachment system is activated by putting the plow controller into “float” mode. Then the operator can completely attached and detached the plow by raising or lowering the toggle switch at the side of the plow. The attachment system has a set of pins that automatically engage locking the plow to the vehicle. When the plow is shipped, the blade crate contains the completely assembled blade (halves for a v plow)minus the coupler, hydraulics & electrical components that are part of the Plow Box. The assembly that provides the tripping action on trip-edge style plows. Base angles can be used as a cutting edge to a certain point before needing to have a cutting edge installed on top of the base angle. Rubber coated “sticks” that give an indication of the location of the edges of the plow and can be seen above the hood of the truck. Shocks on the back of straight blade plows that slows the return speed of the moldboard trip. A type of straight blade plow with two containment wings on the left and right ends. Usually used on skid steers, backhoes, medium loaders, etc. Used on V-blades only, it is a wedge shaped piece that both blade halves hinge on. The actual edge on the plow that touches the ground, usually made of urethane or steel. It is removable and must be replaced as it wears away to prevent plow damage. Either part of or separately attached to the cutting edge that wraps around the outer edge of the base angle to protect it from damage. This contains all truck side electrical components – 13 pin harness, power/ground cables, solenoid, battery cable, controller and all mounting hardware. Either joystick or hand held. Controls all the plow movement from the cab of the truck. The black vertical weldment that houses the hydraulic manifold and power unit. Attached to it are the light bar and push frame. Type of lift system that utilizes a chain to lift the plow off the ground. Used on BOSS first generation conventional plows (1980’s) but has since been replaced by a direct hydraulic lift design. Trip system that has both a full moldboard trip, for collision with obstacles taller than 6 inches, and a trip edge, for collision with obstacles shorter than six inches. The BOSS DXT snow plow features a dual trip design. Function of the plow controller which opens the lowering valve allowing the lift cylinder to extend or retract, keeping the blade in contact with the ground to follow the contour of the surface being plowed. Trip system that is specifically engineered to engage or ‘Trip’ the entire moldboard when striking obstructions. The BOSS VXT, Super Duty, Standard Duty and ATV/UTV blades are examples of blades with a full moldboard trip design. Way of connecting the main truck side harness to the OEM connectors and bulbs. On most snow plows, the plow motor & pump will supply hydraulic fluid to the cylinder. The hydraulics allow the plow operator to life, lower and angle the plow. Used on straight blades to keep the back of the plow upright when detaching. Hydraulically driven cylinder, which raises the snow plow off of the ground. The BOSS system uses a hydraulic cylinder which minimizes movement of the blade while in transport. Used as a angle cylinders on V-blades only, they have an internal, non-adjustable, locking value that hydraulically locks the piston in place. Its main purpose is to keep the blade halves in place while backdragging. The manifold is an aluminum block with channels machined into it. It contains the valves, check valves and relief valves that control the flow of hydraulic fluid, making the plow move. The actual plow blade. The moldboard is available in various materials such as steel, stainless steel or poly. Replacement connector end for the 11-pin or 13-pin electrical system. When the plow is shipped, the plow box contains the main black steel pieces of the plow including the push frame, coupler, headlights and all hydraulics. Plow shoes help the blade float over soft surfaces such as gravel, dirt or grass. Shoes kits are typically optional accessories. This is the entire hydraulic pump, motor and fluid reservoir. Part of the undercarriage, this horizontal bar is what the plow connects to, attaching it to the truck. Sometimes called the “A” frame because of its shape, the push frame connects the center section, on V-blades, or push frame attachment bar, on straight blades, to the coupler. Used on straight and trip-edge plows only. Sometimes called the ‘quad’, it connects the blade of the plow to the push frame. On some box plow designs, the outer left and right sides of the plow can move independently to automatically adjust to the contour of the pavement. On a v-plow, it covers the gap where the cutting edges of the two wings meet on the bottom. It is either built into a cutting edge or attached separately. Typically made of a rubber material or poly. Installed on the top edge of the plow and is used to increase user’s visibility while plowing by minimizing the snow that flies up over the top of the plow and onto the windshield. This mounts under the hood of the truck, and when signaled, sends 12V battery power to the electric motor on the plow. A material used to build a moldboard made from steel and treated with a zinc powder coating for maximum rust protection. Mild steel is also the primary material used for all of a plows support and mounting structures. Single plow blade without wings. Can come in various materials such as steel, stainless steel or poly. A material used to build a moldboard made from made of corrosion resistant stainless steel. On a box plow, trip system which allows the part of the cutting edge that comes into contact with an obstruction to trip independently of the rest of the cutting edge. Trip system which the base angle trips when striking a hidden obstacle, as opposed to the entire blade/moldboard. The springs that allow either the moldboard or plow edge to trip either forward or backwards and then return to the standard position. There are two different kinds of trip springs: extension and torsion. Extension springs are for the moldboard and torsion springs are for the trip edge. This is the bracing that is attached to the vehicle frames. Undercarriages are specific to the vehicle year, make and model. Plow consisting of two independently moving plow blades. V-plows can come in various materials such as steel, stainless steel or poly. These control the follow of hydraulic fluid within the plow manifold. They are opened or closed by an electric coil. Either 13-pin or 11-pin, the harness is installed in the engine compartment of the vehicle and is made up of a series of wires and relays. These carry electrical signals that operate the plows movement and plow lighting. Additional width can be added to the plow unit by adding removal blade wing extensions. These can be easily taken on or off the blade depending on the area needing to be plowed. The wings will add additional plowing width thus cutting down on the time to clear a lot.